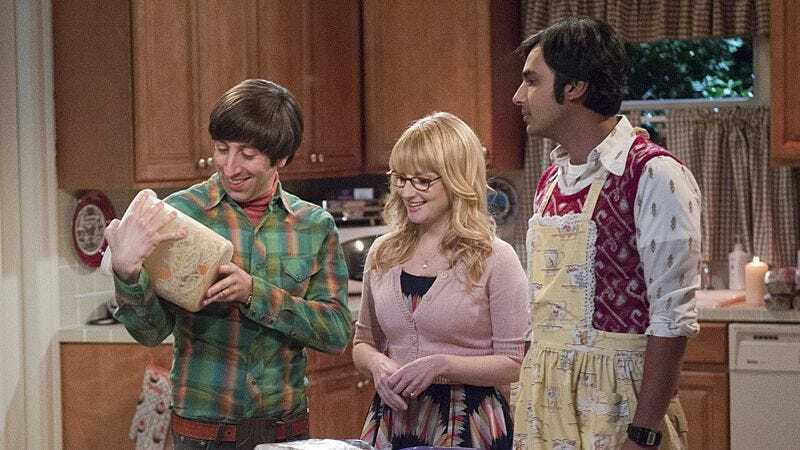 “The Leftover Thermalization” reminds me a lot of the earliest episodes of this season of The Big Bang Theory in that they boast a strange, off-putting tonal imbalance that manages to rob the show of any laughs or poignancy it might be aiming for. Episodes like “The Expedition Approximation” and “The Focus Attenuation” presented the building blocks for solid sitcom storylines, but then failed to follow through with anything resembling a coherent or insightful execution. Much of the same can be said for this episode, which finds Leonard and Sheldon at odds over a magazine article about their recently published paper while Howard attempts to deal with the emotional task of sorting through his mother’s stuff. As can be the case with The Big Bang Theory, the emotions that are at the forefront of the episode are the most unbearable ones. After Sheldon receives a copy of Scientific American, wherein a journalist interviewed Sheldon about the theory he and Leonard recently published, he shares it with Amy, and she notices that Leonard isn’t mentioned once throughout the article. Considering the theory was his idea, it’s egregious that he isn‘t mentioned once. Instead, the article uses the term “Dr. Cooper and his team,” which does seem like a strange way for an apparently reputable scientific publication to cite a paper that only has two authors, but hey, maybe that’s how the science publishing community works. Obviously, Leonard doesn’t take the snub very well. He does have a moment where he understands that having the theory talked about in a positive way is the most important thing, but that rationalization quickly dissipates and turns into childish whining. What’s strange about the next sequence of events, which sees Leonard reprimanding Sheldon for not mentioning him and Sheldon firing back that Leonard is being ridiculous, is that there’s no substantial conflict in the storytelling. The storyline does little to outline why the two are upset with each other. Sure, we can conclude that Sheldon is selfish and socially unaware, and that Leonard constantly needs to be assured that he’s doing a good job (which sums up his relationship with Penny in a nutshell), but that still doesn’t really dig into why Leonard was left out of the article. When Sheldon, while riding in the car with Amy, admits that he didn’t correct the journalist when he called him the “lead scientist,” there’s suddenly a better understanding of the conflict. Sheldon not correcting the journalist is harmful in and of itself, but for Leonard, it’s more about how such an act is nothing out of the ordinary for Sheldon; he’s exactly the kind of person who would take the credit for himself because he feels like he really deserves it/is kind of an egotistical human being. That conversation in the car comes far into the episode though, and it’s representative of the imbalance I mentioned above. The whole episode feels haphazardly patched together in this way; there’s no flow to the narrative and little attention paid to not only constructing logical punchlines that work within the story, but also building towards something cathartic or meaningful. When the whole group (and by that I mean the main cast plus Stuart, but minus Emily because she’s back at home adding more locks to her closet door) gathers at Howard’s mother’s house for one last dinner, the result of a massive power outage that’s threatening to spoil all of Mrs. Wolowitz’s famous homemade food, the feeling should be one of community and support. Initially, that’s exactly what happens, at least before Sheldon and Leonard bring their pettiness to the dinner table. The way in which The Big Bang Theory has handled the death of Mrs. Wolowitz is another example of imbalance. On the one hand, there have been many tender moments, including a few scenes between Bernadette, Raj, and Howard from this episode. Howard’s obsession with his mother’s stash of ketchup packets may be ridiculous, but when he begins to think about how his mother kept a tub of matzah ball soup for whenever he got sick, and he chokes back tears when uttering “I’ll never talk to her again,” there’s something honest and real there. The moment gets at a very significant and relatable aspect of suffering through the death of a loved one; it’s not the grand gestures we remember, but the little things specific to that person, specific to their brand of love, that we’ll miss the most because we can’t get them anywhere else. Mrs. Wolowitz was a character written in broad strokes and often used for an easy laugh, but that’s just our perspective. To Howard, she was an overbearing, loud woman, but one who loved him dearly and clearly put him first in her life. It’s no wonder then that Howard still remains hopelessly attached to his mother, stuck in a state of infancy, because people like Leonard and Sheldon certainly aren’t putting him first when he needs it the most. This kind of characterization, which sees Sheldon and Leonard selfishly putting their argument front and center on a night meant to be about Howard and the group’s shared memory of his mother, is the kind of mean-spirited writing the show sinks to in its worst moments. It’s not that Sheldon and Leonard can’t ever be selfish, or that their fight isn’t warranted on some level, but rather that it derails the entire dinner scene and muscles out any of the emotional elements that are sprinkled throughout the episode. Leonard and Sheldon’s fight steamrolls the more interesting conversations taking place about gender equality and salons at the dinner table, which is a shame, because that’s the exact type of banter that this cast strives on bringing to life. What’s baffling then is not that Leonard and Sheldon are focusing only on themselves, but rather that it happens in an episode that seems to want to make a point, however low-key, about appreciating those around us. There’s a significant dissonance in “The Leftover Thermalization.” It’s an episode that boasts small moments of humanity and empathy, moments that speak to something honest; and yet, with all the bickering going on, those moments hardly have time to connect. Sheldon would still hold a grudge against a kid from Disneyland who got to pull the sword from the stone. Now that’s believable characterization. Oh man, being a slightly chubby dude, I’ve longed for a line of shirts in size “Marge” my whole life. This is my struggle. I really don’t understand why this show treats its characters like children sometimes. It’s neither funny, endearing, nor necessary for creating conflict. It happens every few episodes and I’m always baffled by it. What purpose does it serve to make them so whiny and entitled?